While it’s been popping up on Instagram feeds worldwide, the truth of the matter is, the ancient Chinese medical skin treatment of Gua Sha (meaning “to scrape away illness”) has been around since the Paleolithic Age—a time when hands and/or stones were used on the body to help alleviate symptoms of illness. While the practice today is associated more associated with beautifying the skin on your face versus your entire body like it was back in the day, its roots are still the same. Here’s a deeper look into what this Eastern “facelift” involves. Gua sha (otherwise known as spooning or coining) is an ancient medical procedure that began in China and Southeast Asia. Traditionally conducted on the body (typically by a family member), this ancient medical treatment involved energetically scraping the skin with a tool such as a buffalo horn or antler—but this evolved into using more gentle instruments such as jade stones and porcelain soup spoons. A combination of short and long strokes are made on the back, arms, legs, and buttocks in an effort to increase blood flow and stimulate microcirculation of the soft tissue. what is gua sha used for? Eastern medicine tells us that sluggish energy (chi) in the body may cause inflammation, which in turn causes a myriad of chronic pain conditions. The scraping action on the skin is believed to dismantle the poor energy, reduce inflammation, boost the immune system, relax muscles, release toxins, and encourage healing. Immediate results last for days, but regular sessions are necessary for more deep-rooted conditions. So, What’s Facial Gua Sha Then? Facial gua sha is a more gentle version of the practice that’s conducted on the face. And no, there’s no need to dig up an antler. 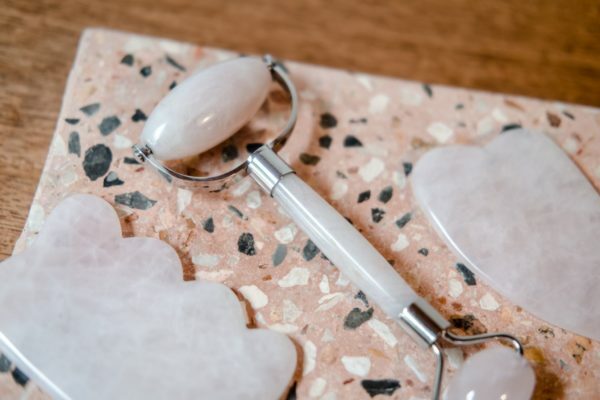 Make no mistake: the gua sha technique is not the same as using the also trendy jade roller that’s on the market. You have more flexibility with a gua sha tool than with a roller, so all of the aforementioned benefits can be achieved depending on your pressure, speed, direction, and which edge you use. It’s also really effective at draining the lymph nodes (lymphatic drainage), so you’ll notice a big difference in the overall appearance of your skin. There are a variety of tools on the market, but choose a stone that feels comfortable in your hand. It’s not a bad idea to have a couple different sizes on hand. For example, one with a smaller curve that can be used around the eye area, another with a V shape that can contour your jawline, etc. Make sure the skin is clean and primed with a serum or lotion so that your tool glides versus skips across your face. Be gentle, especially in areas like the eyes where the skin is thinner. Start with a light pressure until you become more comfortable with the technique. A heavy hand will only lead to bruising. Angle your tool as parallel to your face as possible. Never place the edge flat against the skin like you’re about to cut into something. Take your free hand and hold the skin in the area you’re working in so that it’s taut. This will make it easier for you to effectively manipulate your tool. Always make upward strokes—remember, you want to create a lifting effect. For the best results, conduct facial gua sha two to three times per week. Avoid gua sha if you have an inflamed skin condition. Start at your third eye chakra—the space between the eyebrows—and make a stroke up to your hair line. Next, sweep from the center of the forehead above your eyebrows outwards towards your temples. Using the curved part of your gua sha tool, scrape underneath your eyebrow, right on the brow bone. Using extremely light pressure, slowly stroke the area under your eyes where darkness/puffiness typically surfaces. Start from the side of your nose and move upwards towards your temple. Next, go from the side of your nose, across your cheek, and up to the middle of your ear. Repeat the same motion, except start at the corner of your mouth. Starting at the middle of your chin, sweep under your lower lip and up towards the earlobe. Move under your jaw and sweep up to the bottom of your ear. Finally, scrape from your jaw and earlobe down to the middle of your collarbone. Note this is the only downward motion as you are flushing your lymph system. Sweep from the center of your forehead—right under your hairline—to your temple, then down to your ear until you reach your neck and terminus area (the triangular area at the base of your neck.) Repeat several times. Repeat steps one through nine a minimum of three times and a maximum of ten before moving on to the other side. Remember, practice makes perfect! Have you tried gua sha on yourself? Share your experience in the comments below. The question is: where can I have Gua Sha done to me in Manhattan, NYC? When it states to repeat a minimum of 3 and max of 10 times the movements does that mean each move 3 to 10 times before moving on to the next or doing all moves once and then all again etc.